None of the files shown here are actually hosted on this server. The links are provided solely by this site's users. 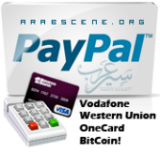 The administrator of this site (http://arabscene.me) cannot be held responsible for what its users post, or any other actions of its users. You may not use this site (http://arabscene.me) to distribute or download any material when you do not have the legal rights to do so. It is your own responsibility to adhere to these terms.